The officials schedules of Light Rail Transit (LRT) and Metro Rail Transit (MRT) was announced today. The LRT and MRT officials said, the operations of the rail transit will be limited this holiday season. According to Hernando Cabrera, the LRT and MRT employees also need a vacation during holidays, in his Twitter account posted on Friday, December 19. 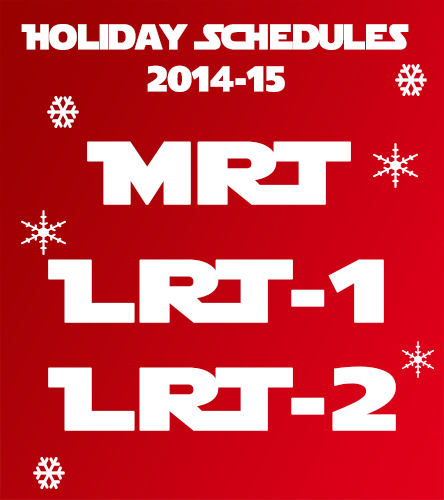 All LRT and MRT employees can also enjoy their long weekends this Christmas holidays until New Year (January 2015). Comments or suggestions about "MRT, LRT Holiday Schedules this Christmas and New Year" is important to us, you may share it by using the comment box below.